Click on the titles to see and hear the music as Scorch files. These songs were begun in 1982, shelved for many years, and completed in 2002 for Marjorie Bunday, who gave the first performance on June 2, 2002. They were written to program with the two mandolin songs by Mozart, as there is not nearly enough repertoire for mandolin and voice. Thomas Campion appealed to me because he was both a poet and a composer. He set his own texts with lute accompaniment, so there was already a history of singing them with a plucked instrument. For the first two songs, I used only his texts and wrote all new music. 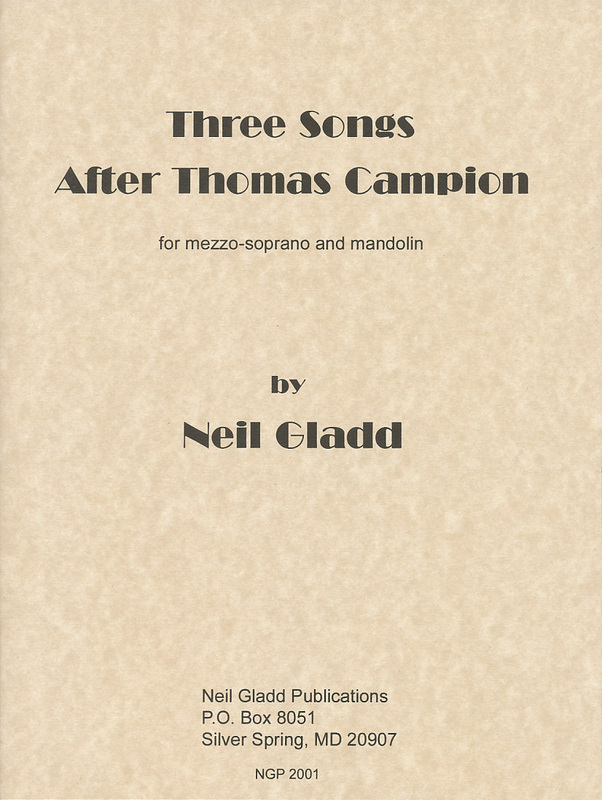 I liked Campion's melody for the last song so well, though, that I decided to keep it and just wrote a new accompaniment for the mandolin. The songs fit easily in the range of either a soprano or a mezzo-soprano. If you are a singer in search of a mandolinist, you can find one in my International Mandolin Directory.